In my endless quest to review Star Trek V: The Final Frontier into a respectable place in the franchise, I realized something. Did you think you were off the hook? You are never off the hook. Our introduction to Sybok, Spock’s estranged half-brother long ago banished for eschewing logic to pursue emotional enlightenment, enhances a pivotal moment in its predecessor. In fact, it enhances Spock’s entire arc in Star Trek IV: The Voyage Home in an unexpectedly pleasant way. Amanda, his mother, enters and explains that the computer knows he’s half-human and is searching for an emotive response. In the context of the one film, it enhances Spock’s arc as he journeys to a new wholeness within himself, affirming that he is more than the sum of his Vulcan logic. When he asks tells his father “I feel fine” during the film’s final reel, we enjoy this revelation with him. In the context of both movies, the question seems more like a Vulcan version of the Voight-Kampff Test. They really want to see if Spock, newly back from the dead, might break and take after his big half-brother. Maybe they wanted to see if he Hulked Out on them. Vis-á-Vis the “Sybok revelation” from Star Trek V, you have to accept that “How Do You Feel?” is more loaded than Amanda may have known. It may have been more loaded than she was permitted to admit. The Vulcans would have been tremendously careful with him during the “retraining of his mind.” Of course it comes through without Star Trek V. I admit that The Voyage Home stands on its own. However, The Final Frontier enhances what comes before thanks to Sybok. 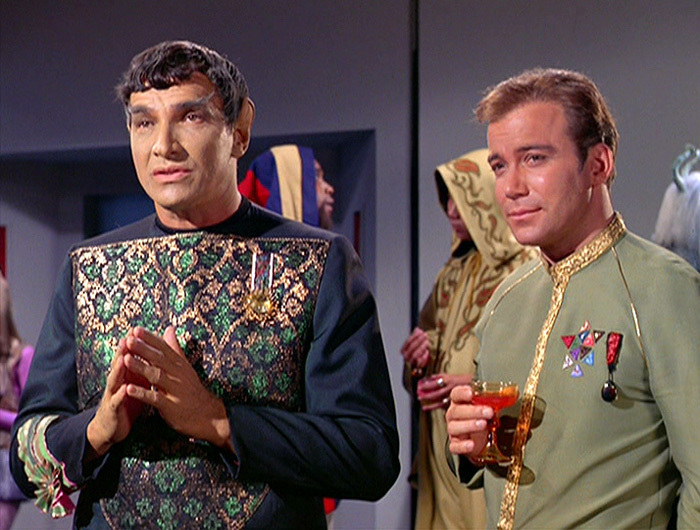 Let’s take it beyond Spock and tie it in to some of Sarek’s idiosyncracies through the series. The Vulcan government probably kept a close eye on his whole family. Despite this, Sarek was rigorous with Spock. Spock almost completed Kohlinar, in fact, and stopped just moments before the ceremony was complete in The Motion Picture. He stopped because of his emotional sense about V’Ger. Later, he pushed for his son to be reanimated in Star Trek III because his logic was “clouded” regarding his family. In light of everything, maybe it’s amazing the Vulcan government even let him be an ambassador. They must have thought that keeping potential rebels close to power was a better way to monitor them. Therefore, Sarek’s history and Spock’s close friendship with humans gave the Vulcan government good reason to worry. Spock was a highly intelligent being who was brought back from the dead literally. He was easily in danger of developing the same messiah complex his half-brother had, if not a more acute case. Whether it was solely for preservation of their monocultural hegemony is a different debate. I can’t help wondering though, as Vulcan appears to be the most stultifying singular culture in the known galaxy. At least the Klingon characters had the excuse of always being military types when we encountered them. The Vulcans were always strictly similar regardless of their job or station. Who would think that a movie so long disregarded as unimportant fluff could provide so much extra insight into the esteemed science fiction franchise? kesseljunkie, that’s who. The guy who consistently out-nerds you all. I’ve forgotten then: what do you regard as worst? The Motion Picture. I brought the box set of all films, and it took me ages to watch them as I didn’t want the stabbing pain in my eyes that I would prefer to watching that one. Welcome back, good to see this blog lives! More are coming, but I don’t have time for a daily challenge. Things will ramp up soon though. Good, this has and shall remain our chessboard. Mano y mano. Light vs Dark, you decide who’s who. Star Trek V runs circles around J.J. Abrams retooling and destruction of Gene Roddenberry’s original vision. I have a soft spot for Star Trek V, and amazingly – AMAZINGLY – the message of it is *as enduring* as anything else they ever did. Sorry for the late reply. Life. I don’t know if I think that Abrams destroyed Roddenberry’s vision — but V definitely has more of the spirit of the original crew than STID did.